Keller is a pitbull mix who was blind and deaf. Georgia was very interested in adopting Keller but was concerned with his disabilities and a few behavior issues. Keller was skilled in escaping any confinement, and he pulled like crazy on leash. He was also a significant jumper. Georgia contacted Steve at Tropical Dog Training to see if we could help. Although Steve has trained blind dogs and deaf dogs, he never worked with one who was blind and deaf. Steve told Georgia he would do his best to train Keller. After four weeks of Steve’s board and train program, Keller would sit, lie down and stay as directed by light touches and would come when triggered with a vibration collar. Keller would then find you by smelling for his treat. A remote training collar was used to let the dog know when he was performing an unwanted behavior. Keller was also taught to accept his crate so he no longer wanted to escape. Crating a blind and deaf dog is key when the dog cannot be observed to maintain his safety. Keller walks nicely on a leash and was adopted by Georgia. Zoe is a small mixed breed dog who lived happily with her owners Pam and Wes until the day that Pam and Wes decided to adopt a new small mixed breed fearful dog named Gracie. After a few days of peaceful coexistence, Gracie attacked Zoe for no apparent reason. Both Zoe and Gracie needed veterinarian care, and Wes was bit while trying to break up the fight. This was the start of many future incidents causing Pam and Wes to be on edge and the dogs to have to live being separated. Pam and Wes were considering the possibility that Gracie would have to be returned to the rescue. Before they took that drastic measure, they contacted a dog trainer to help them resolve the issue. After the dog trainer could not get Gracie to come out from her hiding place, they grew more discourage. Then they contacted Steve at Tropical Dog Training. Steve completed a functional behavior assessment to determine a course of action and developed a behavior change plan which included leadership exercises, obedience training and counter conditioning to prevent any future incidents. After three lessons, the dogs are now playmates. Wes and Pam are more relaxed; the house is free of incidents, and they enjoy their dogs. Mia is a one-and-a-half-year-old Golden Retriever, who would give her owner Donna fits when trying to walk her and take her places. When Donna would try to walk Mia, Mia would pull and lunge at cars that passed. When Mia was taken to public places she would be over stimulated and make the outing unpleasant for the owner. Donna contacted a trainer who recommended the use of a gentle leader, which was never accepted by Mia, and actual further complicated their walks. Donna then contacted Steve at Tropical Dog Training, and after two lessons, Mia walks at Donna’s side and no longer pulls and lunges after cars. After the third, lesson Donna can take Mia to the pet store and enjoy a meal at her favorite restaurant with Mia lying by her side. 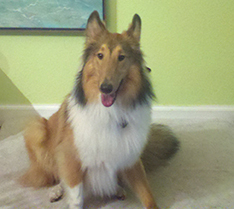 Kid is a one-year-old Collie who loves people so much that he goes crazy when anyone comes over — to the point of jumping on them and knocking them to the ground, ripping their clothes and covering them with hair. This did not work for Fred, Kid’s owner, who works from home and has clients come to the door multiple times a day. Fred’s clients as well as some family members refused to come to his house because of Kid. Then came Steve at Tropical Dog Training. Kid now goes to his place when the doorbell rings and stays there until released by Fred. Kid greets in a nice sit and paw to hand shake. Kid now has better manners than some people.